from the nato's: guess what's in here? my talented friend erica took this pic when we were bored... BAM. there's my belly. no, don't "bring on the pink". her room will be shared with layne, as he is a heavy ,heavy sleeper. lila is a super light sleeper, who goes to bed at around 11pm every night. now, lest you fret, we put her down at 8pm...she sings and jumps and plays and laughs in her crib for 3 hours. ok and then i go in there and get her out around 10pm and read a book with her...then we snuggle. and sing made up songs. and eventually, when i can handle her cuteness no longer, back to bed she goes. she sleeps in until 9am though, so whatever. this will have to change soon. she won't be the only princess around. and i know, my silly routine with lila won't work for a newborn. all i'm trying to say with that tangent is...bring on the red! that's what her area of layne's room will be decorated in. and i'm really excited about the giveaway i have up my sleeve in the next post. it has to do with a blog book. and making one. and having it printed. so i bet you'll never guess what it is... ha. prepare your hearts. hahahaa. too funny. and i love these pictures, very cool. congratulations! A girl! That's what I wanted (for you, not me)! oh how fun! a girl :) can't wait for the giveaway! LOVE the pics! Congrats on another little lady!! Bring on the bows & tutus! Yay for little girls! And good for you for stepping outside of the pink bubble. Red will look great! Yay! Congratulations. I can't wait to see what decorations you cook up! Yay! Congratulations! I can't wait to see what cute decorations you create. Love me some red. You're a brave soul. Three little babies. I'm impressed, you're practically super mom!! I need to work on wrapping my head around having one. Just one. Maybe before I'm 30. Just maybe. what a cute belly! congratulations!!! A girl! So fun! Congrats. WAHOOO! that is SO exciting! Congrats Jami! ahhh! a girl! so happy for you guys!!! i have been a -stalking waiting for the baby update. what a lovebug that baby girl is! So excited for you! So excited for me! We are having another girl as well, and we are having Avery share with her because she is our heavy sleeper too. Went out the same day and bought the coordinating pottery barn bedding (at 70% off) the moment we left the sono. :)She won't use it for 4 years, but that's a sidenote. Here's to two drained bank accounts! woot woot! i love girls! Coming out of lurking to say HELLO and yea for red ;). I found your blog (who knows how ... LOL ... but I don't think it was through your BFF, Emily ;D). I had to send your link to several friends (some of who already knew you ... your famous) and each have enjoyed your blog, your story, your heart as much as I have. Thanks for sharing it with us. Happy (blessed) Red Day!! P.S. I was going to recommend the book, Calm My Anxious Heart by Linda Dillow. It's powerful, it's helpful, it's worthy of every Jesus loving mama to read it (over and over and over ... since we seem to have a hard time giving up the worry). I secretly hoped my 2nd was a boy. Mr.Wonderful keeps saying we should make a girl. I say he can be pregnant. But yay for red and a sweet little girl. Yayyy! We are masters at making girls over here, pretty pumped at all the weddings and proms and junk we get to pay for too.. Awesome, fun times. LUH-VE your baby belly, semi jealous. Fine, whatever super jealous. Congrats lady ;) I love your blogs...mainly because I can picture all of your facial expressions that go along with them! Excited for you to have another gorgeous little princess! hoooooray!!!!! can't wait for our girls to be besties. celebrating that healthy baby girl with you! hooray! i am unfamiliar to the world of girls...only boys in this house! how FUN! congrats and blessings on that little babe. Several things: thanks for the shoutout earlier this week. I'm excited it is a girl. I'll make you a virtual baby blanket. And I see on the Andersons that you get to visit. Who-HOO. I adore the photos!! How clever! And I think that as long as you find a schedule that works for your little one, who cares if she stays up late? Congrats on the lady baby. I can't wait to see what you come up with for the shared room! Three Cheers for a Little Girl! oooh this is some nice pattern clashing! I love me some strips and dots duking it out. Congratulations and love the blog! I found you on my friend Rachael's site, she likes good things. yippy!!! another baby girl! bring on the pink.. i mean RED! so excited for you! I passed on an award to you. :) I think you're pretty trendy girl friend. congrats on a baby girl! we try and try and can't seem to make one. after four boys, i guess we should just give up. 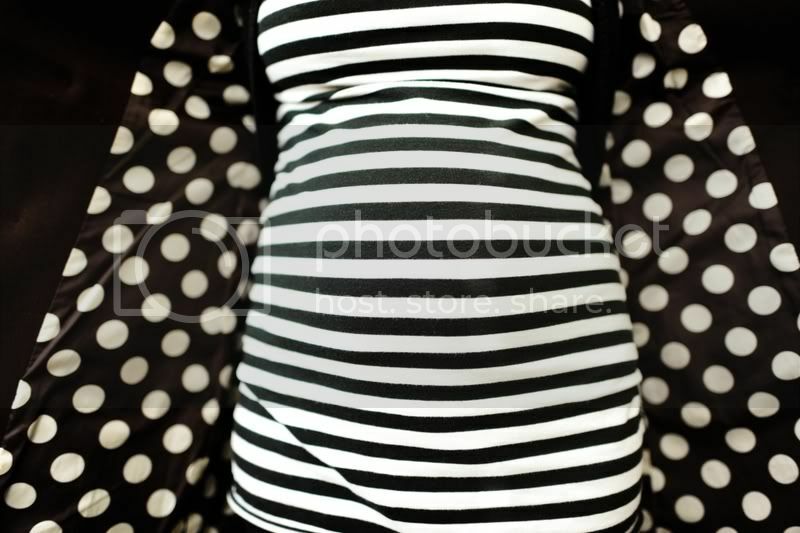 :) love those belly pics. WHOO HOO! CONGRATULATIONS! I am super happy for you, and pray for you and your little lady platypus too! 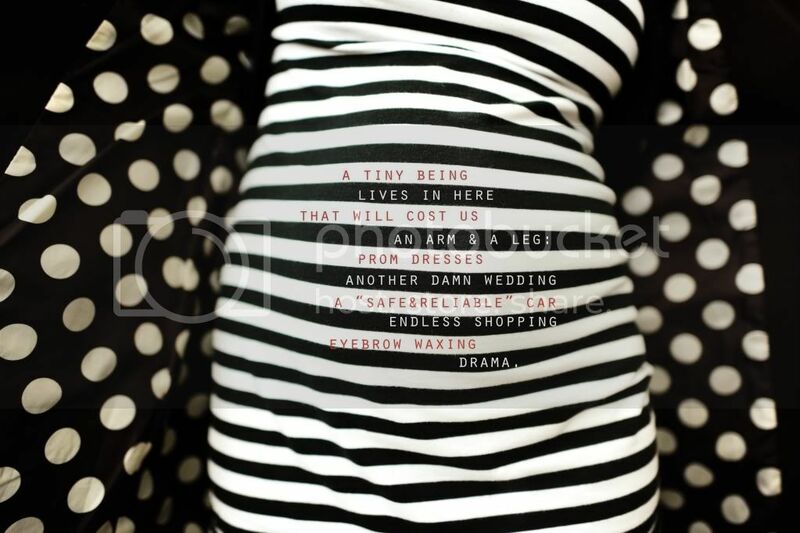 Also, LOVE the belly pics. Jealous of them. Mine looked like "uhh... you are pregnant? What belly?" then they looked like the underside of a beluga whale. Not cute.